Every child is different. I think that’s a bit of an understatement! And it’s no more apparent than when your child gets into the world of reading. Emergent readers are all ready to do new things at different times. Rose was early with letter recognition and the overall want to read. Right now I am watching her breeze through Senior Kindergarten. She is much further ahead than Emma, my first. Where Emma struggled her way through her first years at school, Rose is just sailing right along. Maybe it’s the second child syndrome – wanting to be like her big sister and do homework and all of that. Or maybe she’s just got a different gene combination that’s more me than her dad. Either way it is so fascinating to me to see the similarities, and huge differences, between my girls. At school Rose has begun bringing home reading, and in the last month and a half she has progressed 5 (tiny) reading levels. While I’m not sure exactly what that means, I’m excited that she is improving, and quite quickly! I thought I would share with you some of the things we do with the kids to make reading fun. When we are on the highway for a long-ish trip we play the sign game. Starting at A we have to find a word on a sign that begins with each letter of the alphabet. This game is tricky if you have an older child who is quick and bright (like Emma!) and a younger one who gets frustrated when they don’t get any letters (like Rose). The other tricky part about this is finding signs with words that start with X or Q. Makes for an adventure! At bedtime (or any time you are reading a story) have your little one tell you the first letters of the title of the story. Or if there are fancy words or speech bubbles, this is another place where you can get them interested in telling you letters. Even cereal boxes provide some opportunity to see letters. When I was a kid my mom had a fun phonics set. I have no idea what it was but I remember loving it. We tried buying books for Emma of the “early reader” variety. She had no interest in them. Rose, on the other hand, is ready to have a go. Well most nights – sometimes she’s “too tired!” to even put her pajamas on. My Little Pony Phonics set – Rose loves this set. Emma wouldn’t even take it out of it’s box. Not sure why, but I’m glad Rose is enjoying it. She even takes it to school sometimes, although the box is starting to fall apart now. Rose’s favourite part is reading all the words at the front (pre-story) and then recognizing them inside the story itself. We had better luck with Emma and the I Can Read books. These books are leveled, and some were more interesting to her than others. Rose is just about ready to start into level 1 I think. We have some that are Pete the Cat, and a Berenstain Bears one, and a few Mercer Mayer Little Critter ones. I find my kids are actually more interested in reading magazines. Their Nanny has subscribed them to Chirp (which we’ve grown out of), Chickadee and Owl magazines. Rose loves sounding out the “word of the month” from the back of the Chirp magazines. We bought her Joking Around With Chirp and she loves trying to read the jokes! Emma still struggles with reading. She wants to do it, but only if there are pictures and not too many words on a page. Part of that is due to her developmental delays and we’re working on all of that. 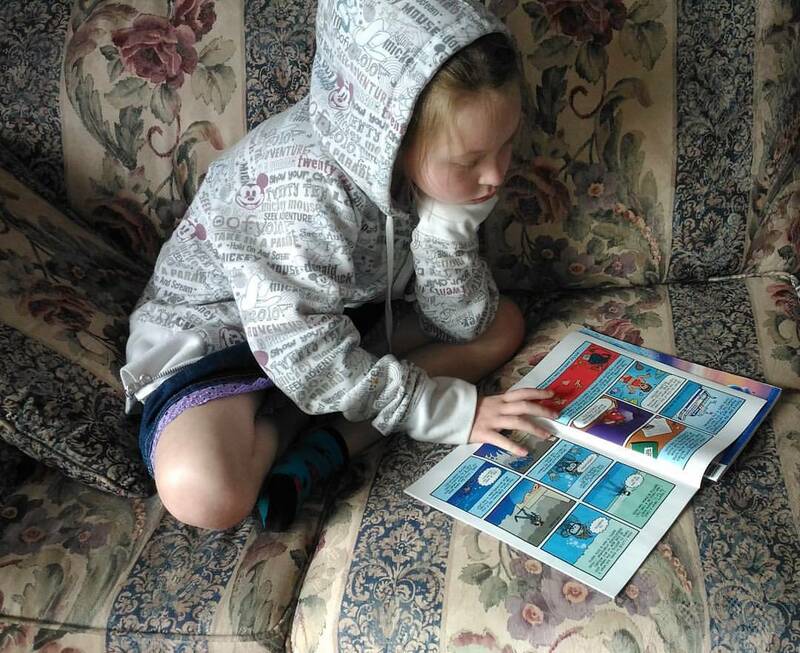 But something we discovered last summer that really helped her enjoy “silent reading” time: Comic Books! I assume it’s because comics are busy on the page but with relatively few words. You can really “get” the story without having to sound all the words out. On Comic Book Day Patrick takes the girls to check out what’s free and they always come home with a collection of books. Emma loves the DC Super Hero Girls. She will then sit and read all afternoon. It’s amazing! I want to hear about the tricks you’ve learned that work with your emergent readers. What fun ways have you found to help them get more interested in reading? Share with me in the comments! I remember that phonics set. It was a very expensive investment but it was well worth it. Your kindergarten teacher had you reading to the other kids. It looks like Rose is following in your footsteps. I can only hope so. Thanks for the comment Mom!